Bert Nienhuis‘ designs are regarded as the most distinctive jewels of the Dutch equivalent of the international Art Nouveau movement; De Nieuwe Kunst, the movement that drastically ended the 19th century; historical styles and ecclecticism made way for natural forms and structures; flowers, plants and curved lines. Designs were harmonized with the natural environment. 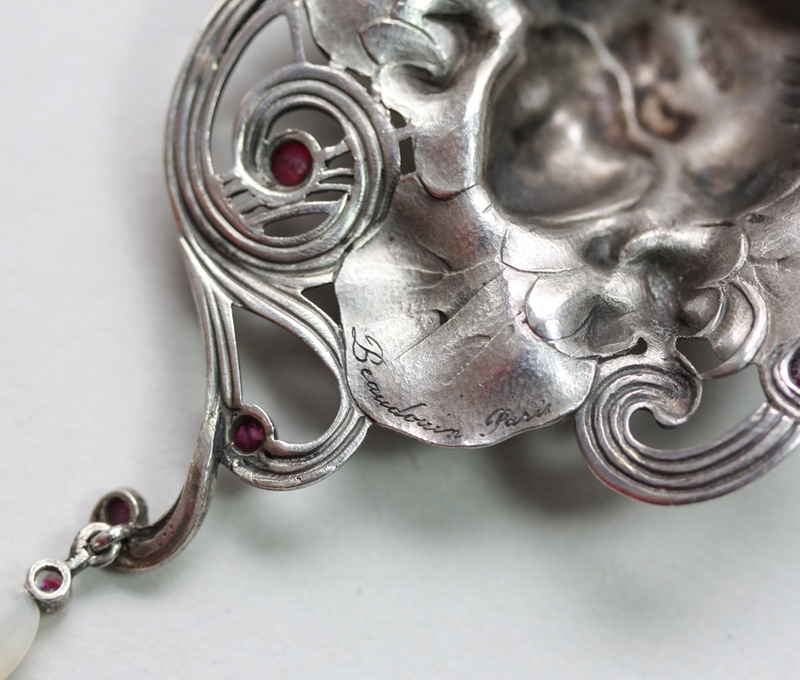 Compared to the exhuberant international movement with its abundance of naturalistic flower, plant and animal motifs and decorative interplay of lines, the Dutch Art Nouveau variant was much more rational and restrained, in jewellery as well as in other applied arts and Architecture. Principles were the logical functional laws of construction and the individual qualities of each material used. Ornaments were only of secondary importance, often geometric and stilised. 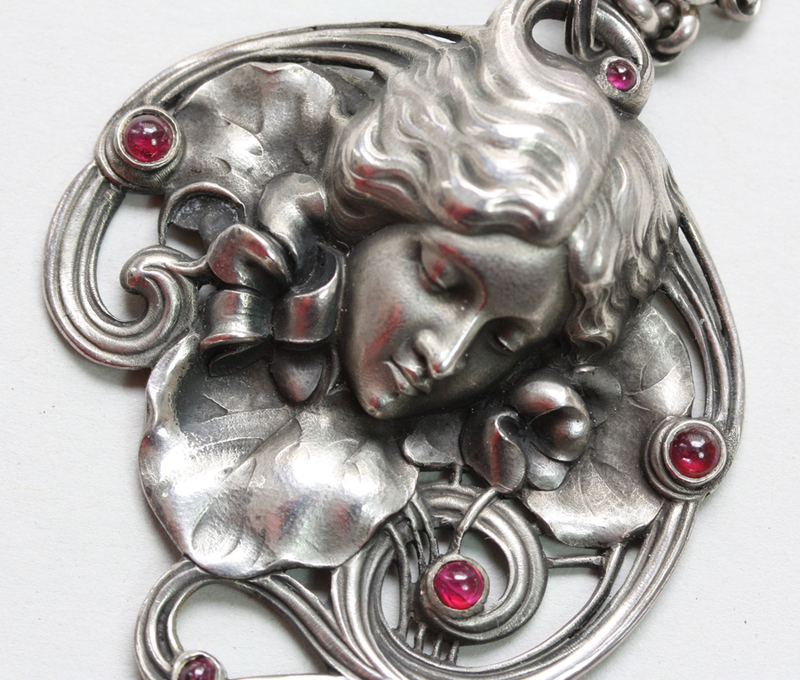 Dutch Art Nouveau jewellery is rare. 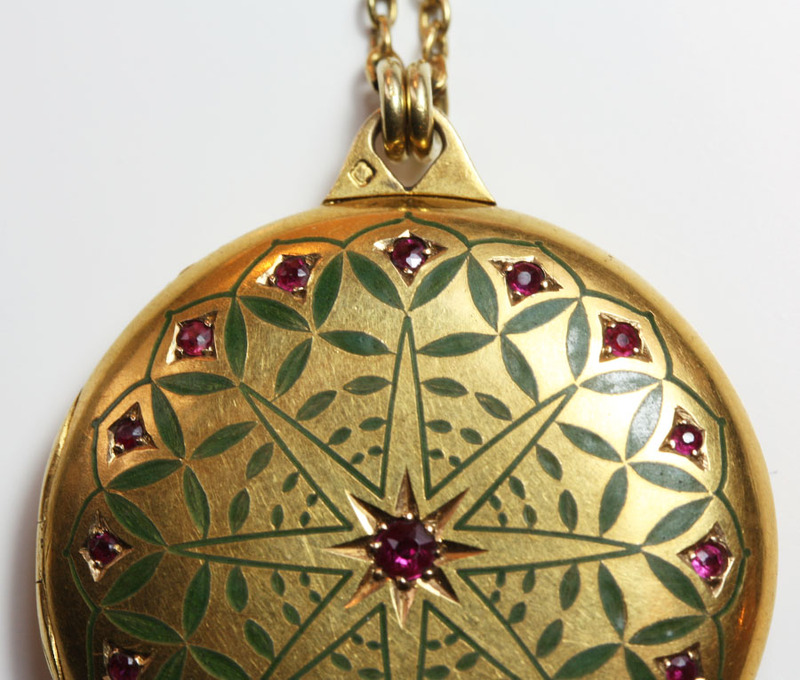 This is one of these rare jewels; an 18 carat gold Dutch Art Nouveau locket pendant with 17 small rubies (16 x 0.01 en 1 x 0.04, app. 0.2 carats in total) and stilised green champleve enamel leaves, in the chain and the lock are little round plaques each decorated with four tiny dots of green enamel, designed by Bert Nienhuis and executed by Louis van Kooten, circa 1905-1911, Netherlands. Bert Nienhuis attended the Amsterdam National School for Applied Arts until 1895 after which he was appointed as director of the earthenware factories “De Distel” and later “De Lotus”. Nienhuis also worked independently as ceramist. Only a short period he designed jewellery, from 1905 until 1911. He made approximately 27 different jewellery designs. Characters of Nienhuis work are geometrical or organical ornamentation decorated with mat uni-colored enamels. He used gold and silver with modest use of gemstones. All the jewels were executed by L.W. van Kooten who worked for the Amsterdam jewellers, Hoeker & Sons, who showed a few of Nienhuis jewels in the International Exhibition in Brussels in 1910 where they won a gold and silver medal. 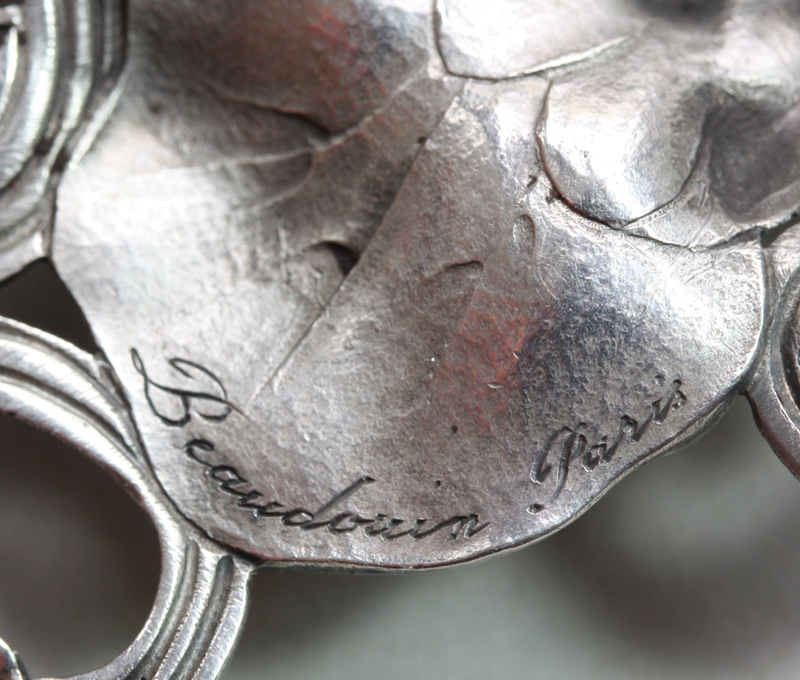 An identical locket is in the Hessisches Landesmuseum in Darmstadt which they bought in 1963 as a part of the collection of the Amsterdam jeweller, K.A. Citroen. Literature: Jewellery 1820-1920, by R.J. Baarsen and G. van Berge, Rijksmuseum Amsterdam 1990, pages 72-79, Van Cooten, Kroniek van een Ambachtelijk Geslacht, by Louk van Kooten, Enschede 1994, pages 79-96, cat. 61.4100/E on page 92, Kunsthandewerk um 1900 by Gerhardt Bot, Darmstadt 1965, page 128, cat. 148.